Most of the Universal sets are centered around versatility rather than functionality, and therefore are not as technically interesting as some of the larger sets. 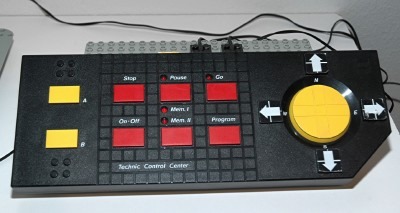 Control Center 8094, released in 1990, was the first set to completely break that mold. Not only did it include the new 9V motor system, it had 2 of them. It was the first set with multiple motors. Rather than a standard battery box, it had an electronic box called the Control Center which was programmable and capable of powering up to 3 motors on 3 different channels. As if this didn't set it apart enough, each and every model was totally unique among Technic and not like anything which had been done before (or since). 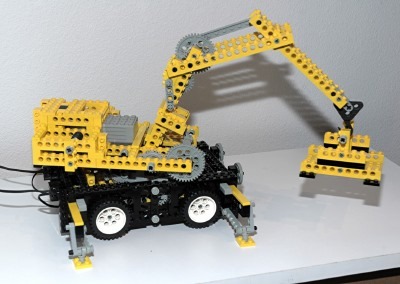 This is one of my favorite of all Technic sets, and should be the near the top of any collector's acquisition list. 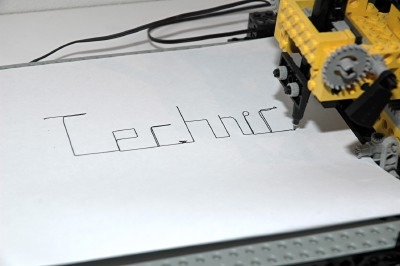 The robotic plotter holds a pen and drives two wheels independently, allowing for zero radius turning. The pen plotter also holds the pen and has a platter for paper. The carriage can translate on two motorized axes. 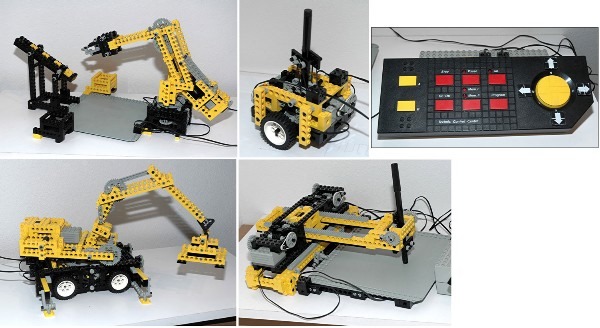 The robotic arm can slew, raise and lower the arm, and open and close the end effector. It includes a simple task to perform: sorting 1x2 beams into bins. Finally, the mobile crane features outriggers, motorized slewing, and a motorized boom and jib. If it sounds like some of these models have more than two motorized functions, that would be correct. The models use an ingenious mechanical system to allow individual motors to control more than one function automatically. The number of ways that this set is new and/or distinct is large. It is one of very few sets not to have any steerable axles on the model wheels. It is among the first 2 sets to include the 9V motor, and the first set to include more than one motor of any kind. It is the first set with a system for programming the models. 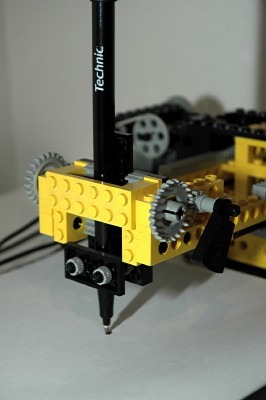 It is the only set in history to include the special Technic branded refillable pen. If you want this pen, this is the only place to get it. I find the robotic arm the most interesting, even though it does not have as many functions as the mobile crane, so it is the model I choose to keep on display from this set. The Control Center is the heart of this set. 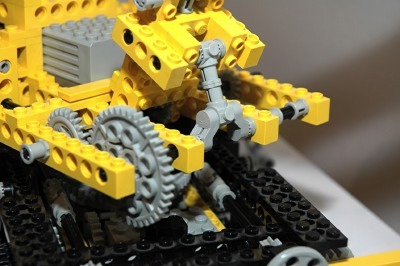 It was the first programmable power system for LEGO® motors. There is a battery compartment on the bottom which holds 6 C sized batteries (LR14) in series, producing a total of 9 volts DC. The Control Center has 3 color coded power outputs, each capable of driving a 9V motor. The yellow output is labeled "A-B" and is controlled by the two yellow buttons on the left with the same labels. One buttons drives one direction, and the other reverses polarity and drives the motor the other way. The red and blue outputs are labeled "N-S" and "E-W". They are controlled by a 4 way control pad on the right. Movement of the control pad in a diagonal direction effectively controls 2 channels at once. The red buttons in the center control programming. There are two memory sections which the Control Center can toggle between. Once a memory is selected, you can push Program and the system will record your inputs, including duration, and including pauses. When you are done recording the program, you push Stop and it is stored to memory, even if the unit is switched off. You can then play it back (Go) at any time, or you can control the system manually. There is obviously some limit to the amount of memory on the system so it can only record a certain number of inputs, however, I have never found the limit. 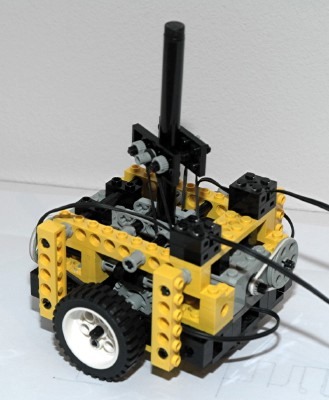 This little robot is used to draw crude images. It rides on two wheels and is balanced by pins at the other two corners. Each wheel is powered by an independent motor. 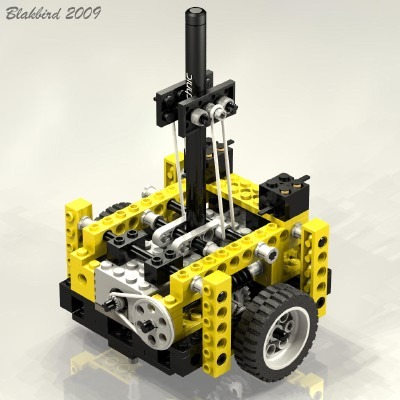 Since the wheels can be driven in opposite directions, the robot is capable of turning with zero radius. The computer image shows the drive system. 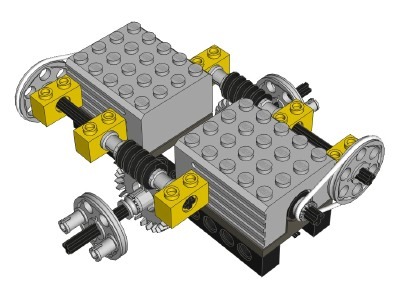 Each motor drives a pulley via a belt. The pulley then drives a 24 tooth crown gear through a worm gear, resulting in a reduction of about 75:1. 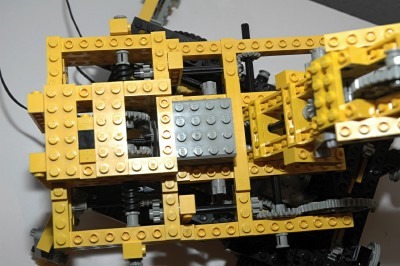 A Technic pen is clamped in the center of the assembly with a pair of threaded axles. The pen passes all the way through the assembly to the paper. A pair rubber bands pull the pen down against the paper. As you can see from the example image, it is pretty hard to draw anything coherent with this system, but it is fun to try. The animation is not real-time, but the jerky motion seen in it is still indicative of how the robot really moves. 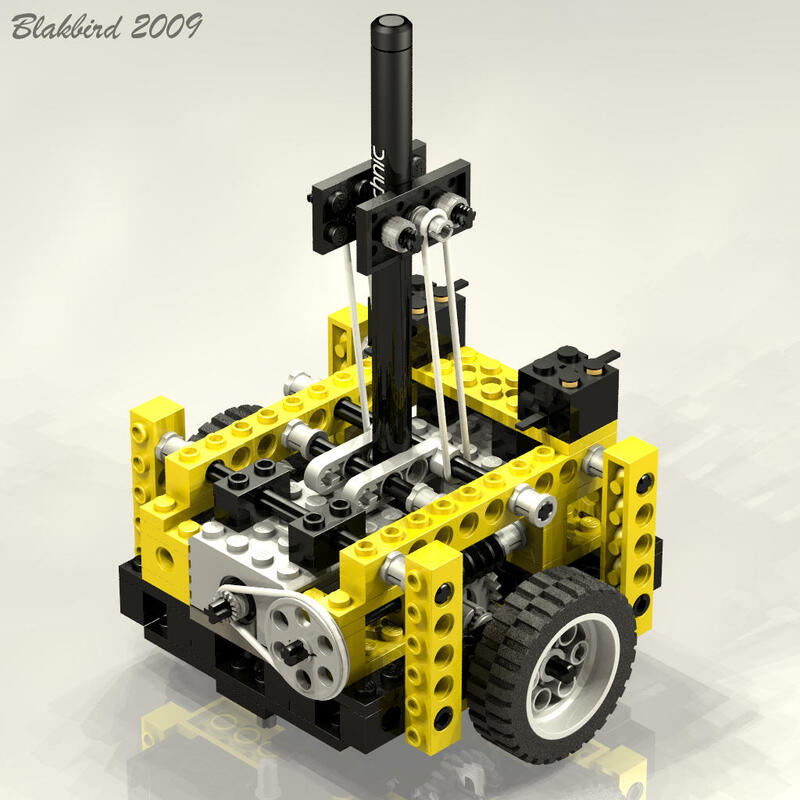 Click for an animation of the robot in motion. 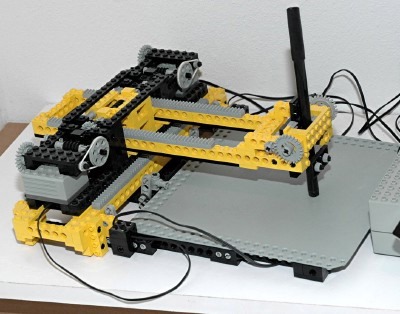 The plotter is an exceptionally unique model, and a good simplification of how real servo motors driven by a programmable system might be used. The plotter is motorized to translate along two axes independently (or together). Diagonal lines are possible by running both motors together, but tricky to do accurately. The remote control system has no means to lift the pen, so the plot is typically one continuous series of lines as shown in the example image. The pen can be lifted manually. 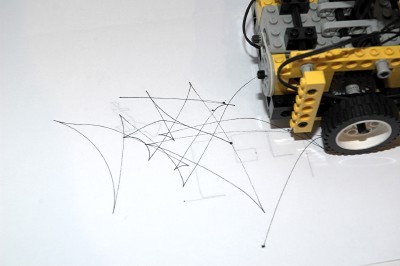 The drawing method using the plotter is similar to the popular toy "Etch A Sketch". 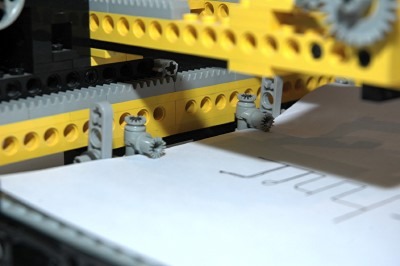 Click for an animation of the plotter in motion. 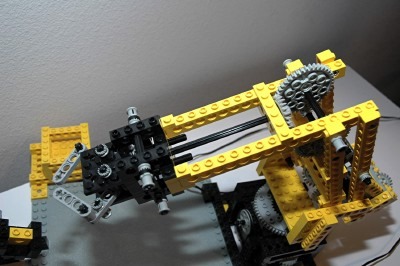 The Technic pen is supported at the end of the carriage arm and clamped by threaded axles. A weighted element is used to push the pen down against the paper. The weight has an axle slot at one end. Since the weight is unbalanced, it tends to rotate the axle. This force against the paper also tends to push the end of the carriage arm up. 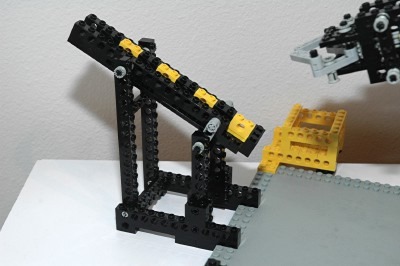 The weight can be rotated to lift the pen from the paper via the gear system. The weight drives a pair of 8 tooth spur gears. The gears drive 24 tooth crowns. On the same axle are a pair of pinions which engage rack gears on the pen clamp. The plotter even includes a means to secure the paper. 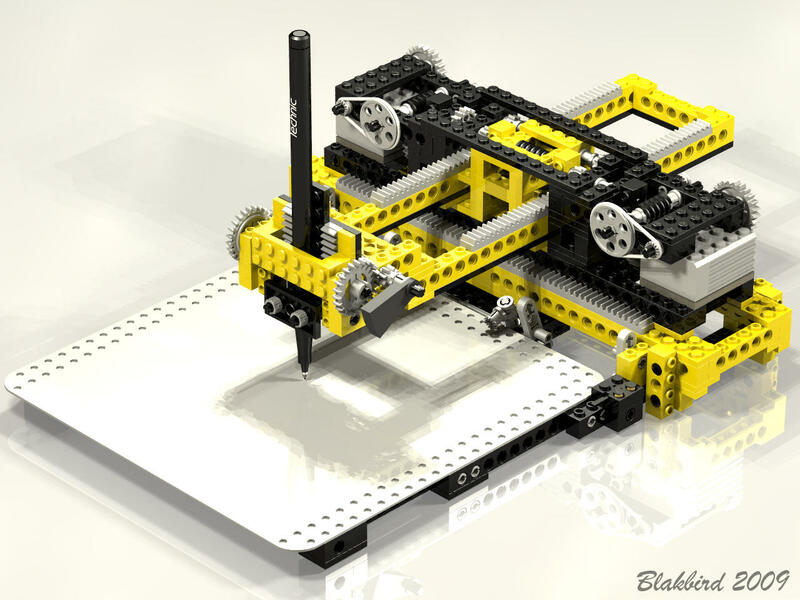 A baseplate is used as a platform. A pair of toothed connnectors, shown in the image, are preloaded against the paper with rubber bands to hold it in place. This prevents the friction on the pen from dragging the paper around the platform. The carriage is motorized to translate on two axes. The motors can be used independently to create horizontal or vertical lines, or together to create diagonal lines. The motors drive at roughly the same rate, so 0, 45, and 90 degrees are the only possible angles. We'll call the side-to-side motion the X axis. The X axis motor has an 8 tooth spur gear on the output shaft (first computer image) and drives a 24 tooth spur gear. This drives through a set of pulleys using a belt. The belt system allows the gears to slip instead of stalling the motor when reaching the axis end stop. Next, a worm gear drives a 24 tooth crown. The next two stages of 16 tooth spurs and 14 tooth bevels are 1:1. Finally, an 8 tooth pinion drives a long set of rack gears. Final reduction is about 216:1. The whole carriage slides on, and is supported by, tiles on the base. It cannot slide far enough to become unbalanced and fall off the side. We'll call the front-to-back motion the Y axis. 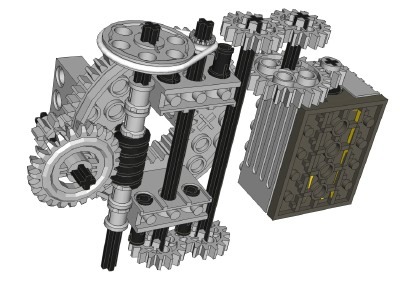 The Y axis motor has an 8 tooth spur gear on the output shaft (second computer image) and drives a 24 tooth spur gear. This drives through a set of pulleys using a belt. Next, a worm gear drives a 24 tooth crown. The next stage is a pair of 16 tooth spurs. Finally, a pair of 8 tooth pinions drive a long set of rack gears. Final reduction is about 216:1, the same as the X axis. 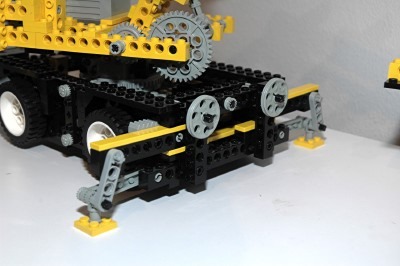 The whole carriage arm slides on, and is supported by, tiles on the main carriage. 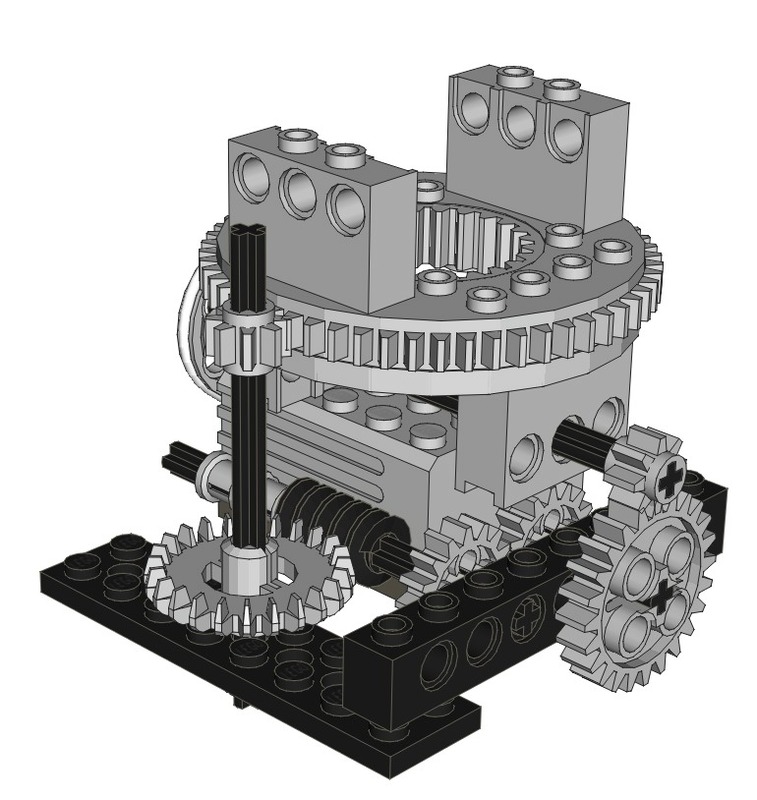 A second set of pinion gears engage the racks and prevent the cantilever moment from tipping the arm off the carriage. 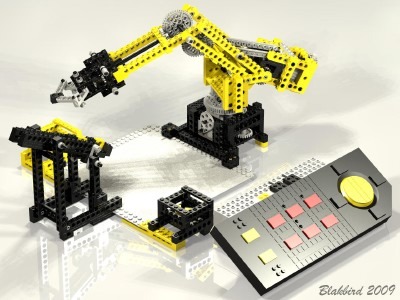 This robotic arm performs the task of lifting 1x2 beams from a chute and sorting them into color coded bins. It would be many years before something similar was available using the computerized Mindstorms® system. This is an excellent example of the complex functions which could be achieved with a relatively small variety of parts. The arm is capable of rotating, lifting, and opening the end effector. There are 3 motorized functions despite the fact that there are only two motors. The method used to achieve this is quite clever and is described below. 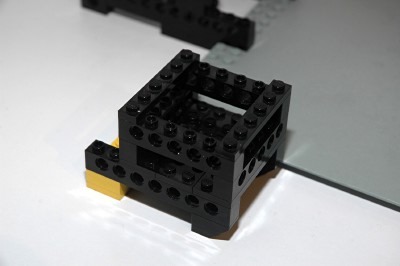 A base plate is used to hold all of the assemblies in the correct position relative to each other. 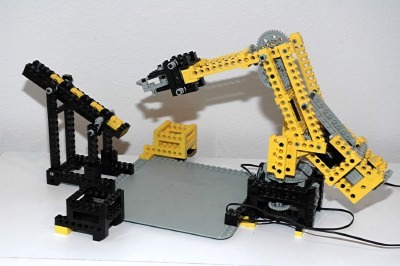 Click for an animation of the robotic arm in motion. The arm can be rotated side to side using a motor contained in the fixed base. The system is supported by the new Technic turntable which is able to support the unbalanced weight without falling apart. The motor drives a pulley through a belt (hidden behind the turntable in the computer image). This axle then drives a set of 8 and 24 tooth spur gears followed by a set of 16 tooth spur gears. Next a worm gear drives a 24 tooth crown. Finally, an 8 tooth pinion drives the outer ring gear of the turntable which has 56 teeth. Final gear reduction is 3:1 x 24:8 x 16:16 x 24:1 x 56:8 = 1512:1. Based on the motor's loaded rotation rate of 2000 rpm, the rotation rate of the arm is about 1.3 rpm with a full 9V charge. The rate shown in the animation is much faster than scale. Click for an animation of the arm rotating. The motorized lifting and grasping end effector is practically magic. 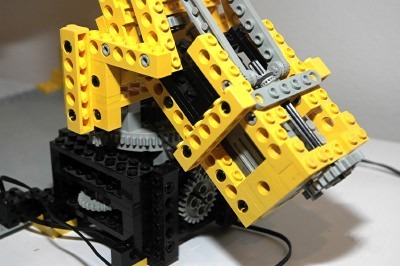 Both functions are controlled by a single motor mounted in the back of the arm and used as a counterweight. The color coded computer image can be used to help explain the workings of the system. 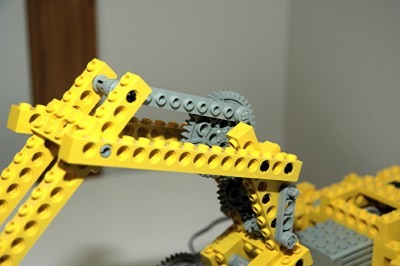 When the arm is in the fully down position, the beams making up the 4 bar linkage are bottomed, which prevents the arm from descending any further. 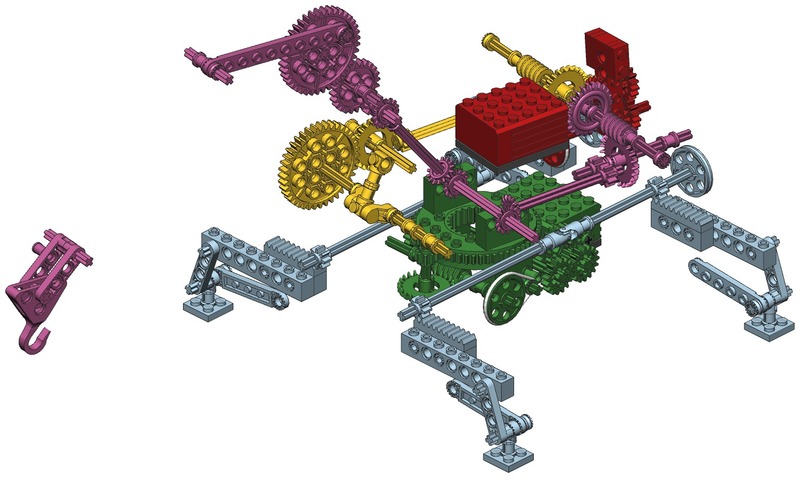 In this position, the path from the motors to the end effector is as follows. The motor drives an 8 tooth spur gear into a 24 tooth spur. Next comes a belt drive through a pair of pulleys to prevent the motor from stalling. The first blue axle then drives a 24 tooth crown through a worm gear, preventing backdriving of the system. A triplet of 3-24 tooth gears follows. A 24 tooth crown then drives a large 40 tooth spur gear on the third blue axle. The next major gear reduction happens through the set of red and green 8 and 40 tooth spurs (more about these later). This large gear then drives a 24 tooth crown. A pair of 8 tooth pinions then drive a pair of 16 tooth spur gears which rotate in opposite directions. Finally, two sets of 14 tooth bevel gears drive the liftarms which make up the end effector. Final gear reduction is 24:8 x 3:1 x 24:1 x 24:24 x 24:24 x 40:24 x 40:8 x 24:40 x 8:8 x 16:16 x 14:14 = 1080:1. The fingers can be opened and closed by reversing the motor. The lifting of the arm uses the very same gear system. How is this possible? When the end effector closes on something, either itself or an item it is grasping, the last blue axle becomes effectively locked. Remember those red and green gears in the image? 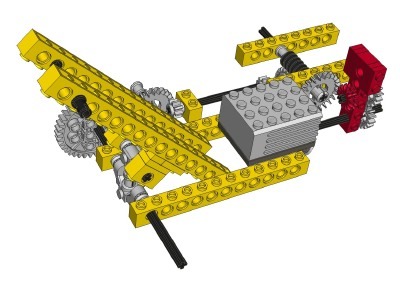 When the last blue axle is locked, relative rotation of the red and green gears causes the angle between the yellow beams to change, thereby rotating the 4 bar linkage. 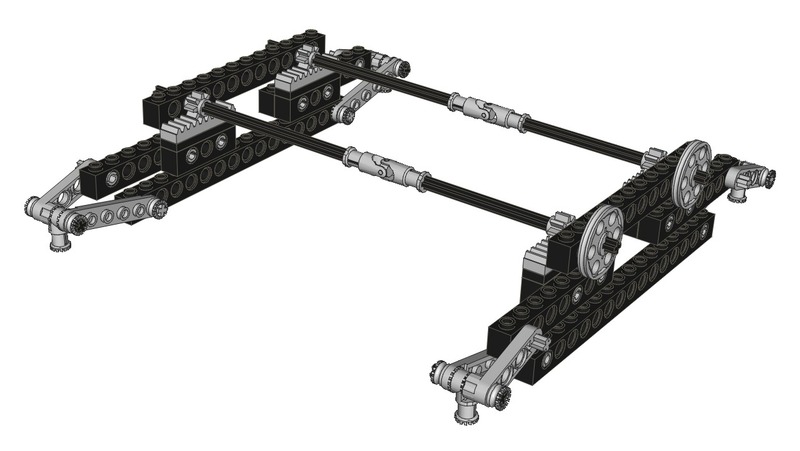 Because the 2 long arms of the 4 bar linkage are different lengths (1 stud difference), the arm changes shape and lifts. Since this function does not use the last 4 stages of the gear system, the reduction is 1800:1. It only takes a rotation of 3 teeth on the red 40 tooth gear to lift the arm, so total lifting time is about (1800/2000) x (3/40) = 0.00675 min ~ 4 seconds. The difference between these two types of motion can be seen using a close study of the animation. Click for an animation end effector grabbing and lifting. 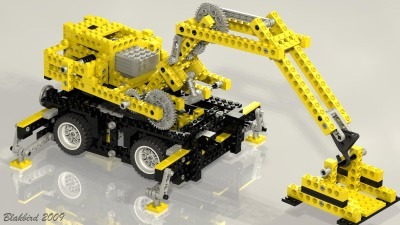 This motorized mobile crane has a host of fascinating functions. It has outriggers (pictured in light blue), a slewing platform (pictured in green), and a lifting boom (pictured in yellow) and jib (pictured in purple). The multiple lifting functions are achieved with a single motor mounted in the superstucture through a pendular gear which can be seen in red in the computer images. The other motor drives the slewing motion and is located in the base. The 4 Model Team wheels are not steerable. Click for an animation of the crane in motion. The boom can be raised and lowered using the upper motor, but only by driving the motor in a single direction. The red pundulum shown in the computer image is driven to the right of the motor by the friction in the axle. This causes it to engage the gear system on that side. 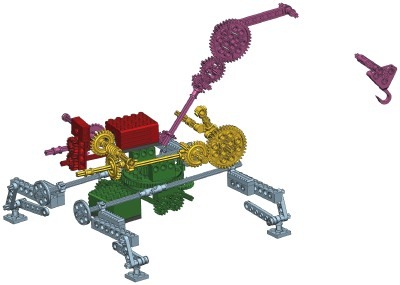 The motor drives a pulley through a belt and then a set of 16 tooth spur gears. A pair of 14 tooth bevel gears then mesh with a 24 tooth crown. A worm gear drives the next 24 tooth crown. Next, an 8 tooth pinion mates with another 24 tooth crown, which finally drives a 40 tooth spur gear. Final reduction is 617:1. The final axle drives a pair of the new crankshaft elements. Revolution of these elements causes an osciallation of the boom up and down. The boom can only be driven one direction; you can't go backwards. Instead, you have to wait for it to cycle back around the where it started. You can see this clearly in the animation. Click for an animation of the boom lifting. The jib can be raised and lowered using the upper motor, but only by driving the motor in a single direction. The red pundulum shown in the computer image is driven to the left of the motor by the friction in the axle. This causes it to engage the gear system on that side. The motor drives a pulley through a belt and then a set of 16 tooth spur gears. A pair of 14 tooth bevel gears then mesh with a 24 tooth crown. A worm gear drives the next 24 tooth crown. Next come a set of 8 tooth pinions followed by a set of 14 tooth bevel gears. 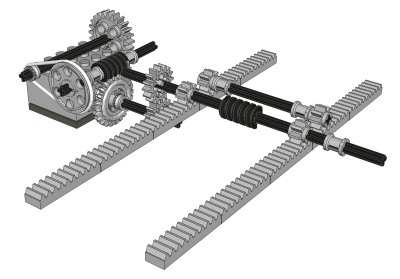 After the bevel gears, the axle passes through the axis of rotation of the boom. 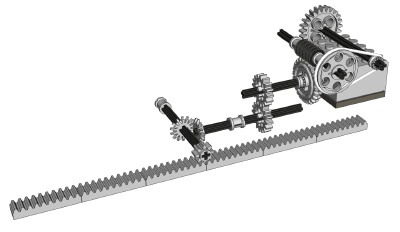 A pair of 14 tooth bevel gears make a 90 degree turn and are followed by another pair. Finally come an 8, a 24, and a 40 tooth spur gear. Final reduction is 617:1, just like the boom. The 40 tooth gear has a link attached to one of the off-center pin holes. Revolution of the gear causes an osciallation of the jib up and down. The jib can only be driven one direction; you can't go backwards. Instead, you have to wait for it to cycle back around the where it started. You can see this clearly in the animation. Click for an animation of the jib lifting. The entire superstructure slews on one of the new turntables which is able to support the unbalanced weight without falling apart. The motor for this function is located in the base. The motor drives a set of 8 and 24 tooth spur gears followed by two pairs of 16 tooth spurs. A belt comes next, driven by a pair of pulleys. Then a worm gear drives a 24 tooth crown. Finally, an 8 tooth pinion drives the outer ring gear of the turntable which has 56 teeth. Final gear reduction is 24:8 x 16:16 x 16:16 x 3:1 x 24:1 x 56:8 = 1512:1. Note that, unlike the animation, the model can not rotate 360 degrees an infinite number of times. Since the wires pass up through the turntable they will become twisted if it rotates too far. 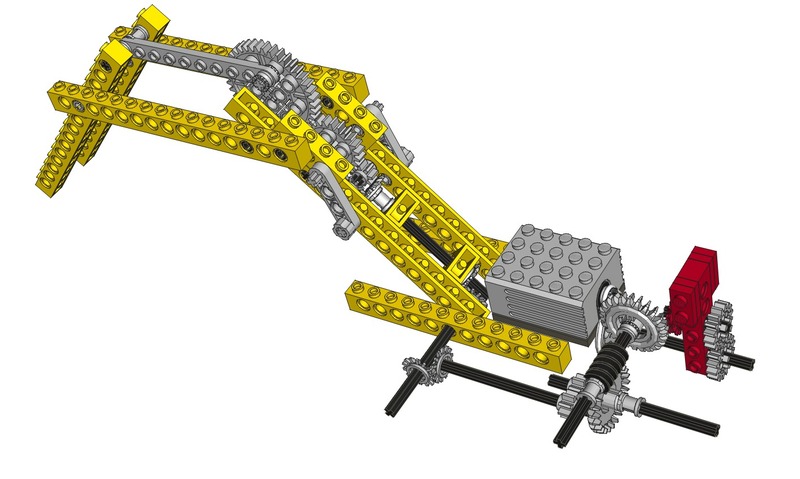 Click for an animation of the crane slewing. Four outriggers are located at the corners for stability. 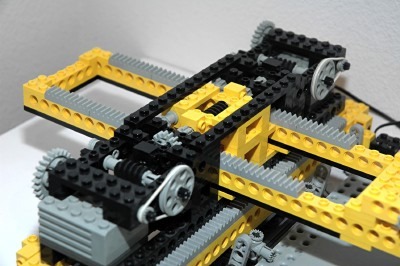 They translate outward on tracks made from tiles via a rack and pinion system as shown in the computer image. As the outriggers reach their most outboard position, the attached liftarms become almost vertical, supporting the weight of the crane without backdriving. Due to the geometry of the system, deployment of the outriggers actually lifts the wheels slightly off the ground. The outrigger arms are prevented from rotating inside the body by tightly placed tiles about and below. Click for an animation of the outriggers deploying.